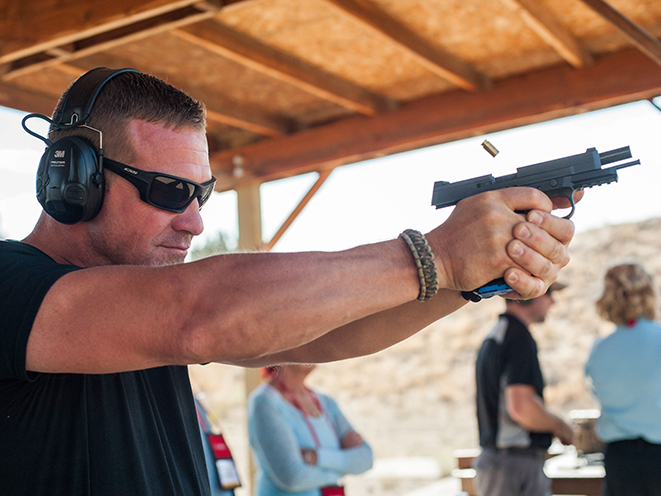 Chris Cerino, a respected trainer and former "Top Shot" contestant and US Air Marshal, breaks down five must-know shooting fundamentals. 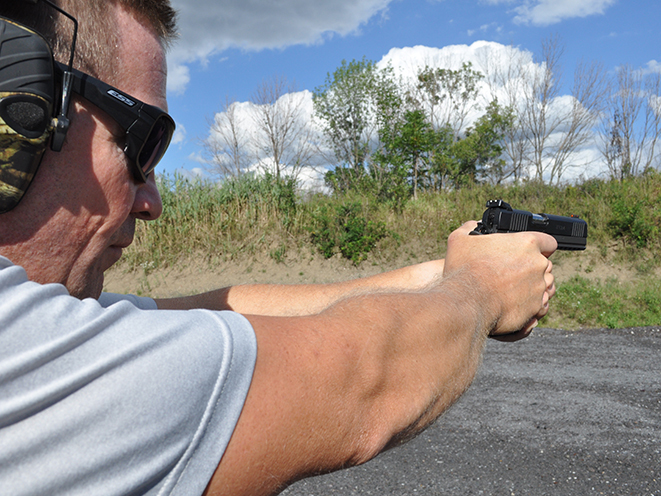 <b>Practice consistent draws.</b> Your weak hand should meet the gun high in front of your chest while keeping the gun close to the body until it’s pushed out to acquire the sight picture. The finger shouldn’t go into the triggerguard until the gun is horizontal. 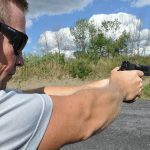 <b>Your strong-hand grip should be high on the backstrap</b> with the gun in the web of your hand, with 50 percent or less of the grip coming from the strong hand in a two-handed grip. 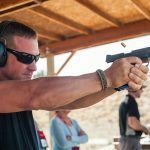 Grip pressure should be front to rear, like pliers, and the trigger finger should go where you need it to operate the trigger smoothly. The heel of the support hand should cover the part of the grip not covered by the strong hand. The strong thumb rides on top of the support-hand thumb without exerting downward pressure. The support hand should wrap over the strong hand and account for 50 percent or more of the total grip. With both hands, there should be no space between the fingers and the triggerguard, and they should be tight to the triggerguard’s bottom. <b>Sight alignment begins with focusing on the target</b> until the gun is pushed out for the shot. Then your focus should change back to the front sight and be maintained through the shot and into the next shot. 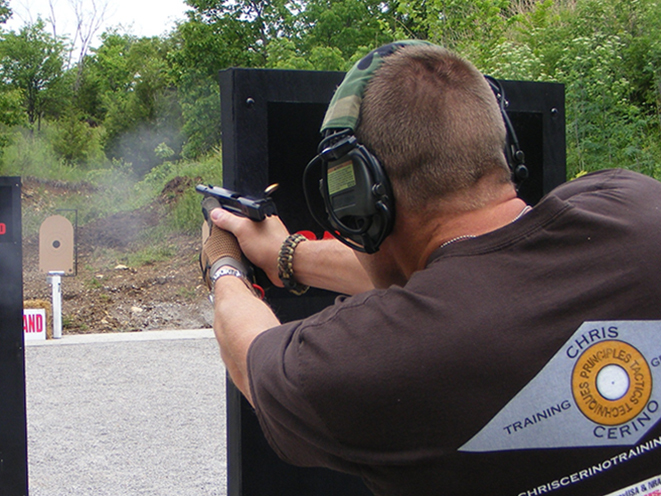 <b>Trigger management is the most important aspect</b> of shooting a pistol. While other principles are important, consistent accuracy can never be achieved without proper trigger management. 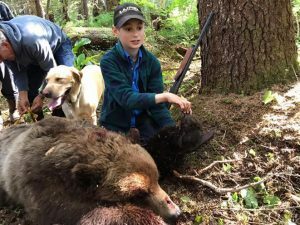 Your trigger pull method varies depending on the gun. Double-action triggers should be operated like a lever with a lot of finger on the trigger for better control. Guns with light single-action triggers, like tuned 1911s, should be operated like a push button, using a sensitive and light press to control the trigger. The trigger should be prepped by taking out any slack to the pressure wall and then pressing it until the gun goes off. It’s important to learn to shoot as soon as the sight picture is right. 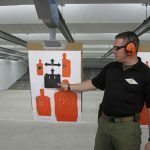 Cerino says, “If the target is not neutralized, you continue shooting every time the sight picture is aligned until it is.” With proper training and practice, the shooter can be conditioned to press the trigger to break when the sight picture is right. <b>Follow through by maintaining contact with the trigger</b> while firing the shot and beginning the reset cycle during recoil. 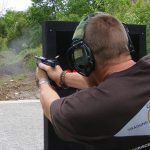 The sight picture should be maintained during recovery, and if the target isn’t down, the trigger cycle begins again with every shot coming from that pressure wall. 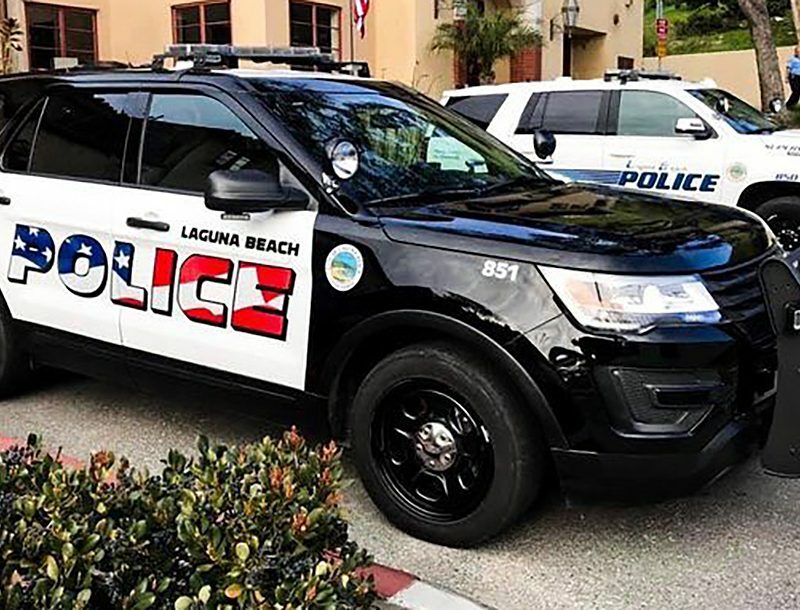 Once the target is neutralized, the shooter should bring the gun back close to his or her body, scanning to break tunnel vision with the target to make sure there is no more danger, then holster the gun. I first met Chris Cerino at the 2011 Bianchi Cup. It was just after the first season of the History Channel’s ‘Top Shot” TV series, and he was just starting his training company, the Cerino Consulting & Training Group. He was an excellent shooter and had an infectious, positive attitude. Later, I took his four-day Diagnostic Pistol Instructor Course and learned more about teaching pistol shooting than I’d acquired in the previous 30 years of teaching people to shoot. 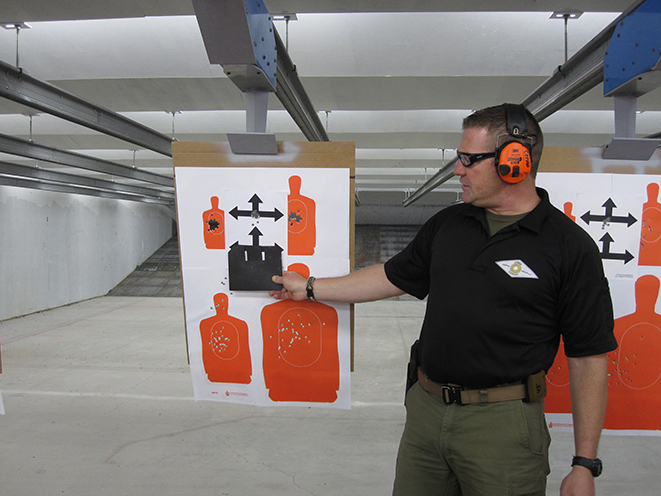 A former federal air marshal and a shooting instructor for the agency, Cerino has an analytical approach to training shooters. He has thought out the issues that prevent good performance and has a way of presenting them that’s revealing and helpful. As a former air marshal, Cerino stresses the importance of accuracy, advising that accuracy takes precedence over speed—but don’t think he can’t shoot fast. His methods come from long hours of practice with the air marshals, sitting for long hours before a Simunition gunfight is initiated by a simulated attacker. Shots must be accurate and fast in that kind of environment. With training and practice, a shooter can acquire the sight picture and get off shots both quickly and accurately. 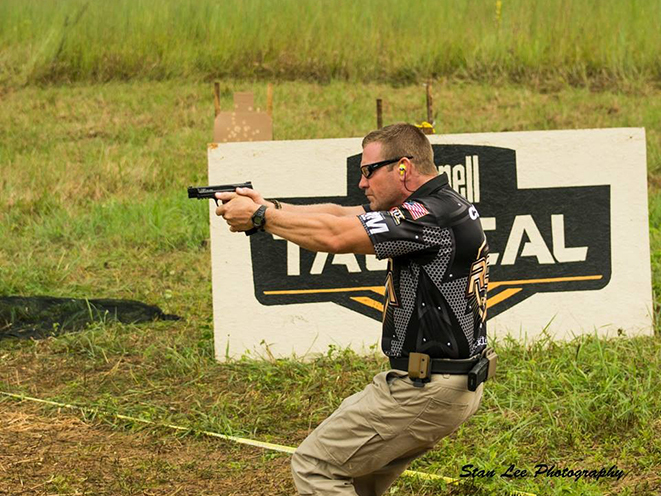 Scroll through the gallery above to learn about Chris Cerino’s five shooting fundamentals. 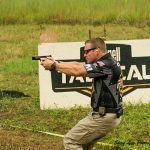 This article was originally published in “Combat Handguns” July/August 2017. To order a copy, visit outdoorgroupstore.com.